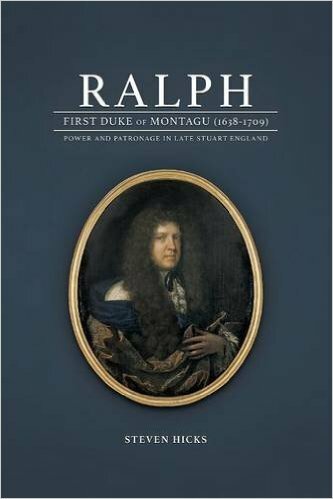 Ralph, First Duke of Montagu (1638-1709) by Steven Hicks is a remarkable biography of this leading nobleman of the 17th and early 18th centuries. Subtitled Power and Patronage in Late Stuart England, it’s an account not only of this extraordinary grandee’s life but also of the tortuous and dangerous world of the high politics of the time. The author has delved deep into contemporary correspondence, so we read the actual words of the actors – Montagu himself, Charles II, and courtiers on various sides, writing with various degrees of sincerity. Montagu rubbed shoulders with the monarchs Louis XIV, Charles II and William III, and also with scientists and thinkers such as Robert Hooke and John Locke. Steven’s selections from Montagu’s letters give us fascinating glimpses of that world – for example, when as English Ambassador to Paris Montagu is negotiating peace and war, or haggling over the secret subsidy Louis XIV is paying Charles II to help him live without having to call a Parliament. We can read letters from Montagu in which he nakedly asks for a dukedom (eventually granted) and to be made a Knight of the Garter (not granted). We see him conspiring to bring about the downfall of Charles II’s first minister Danby (whose orders he had previously been taking when ambassador), and actively seeking to exclude James II from the throne. The book contains some fascinating illustrations. It’s published by New Generation Publishing, ISBN 978-1-78507-297-0. To learn more or to buy a copy (£15) contact the author at RalphMontagu@gmail.com.